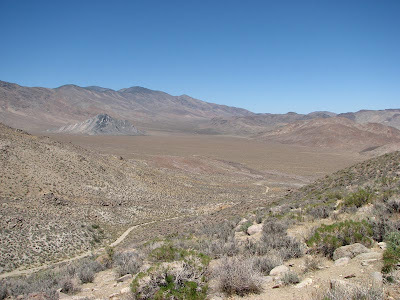 Mark and I made a big loop yesterday to explore remote places in the southern portion of Death Valley National Park. 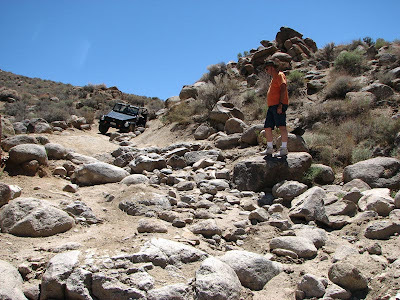 We started at Ballarat and headed south to drive through Goler Wash and over Mengel Pass. We stopped briefly in Butte Valley to check out the cabins and take photos of Striped Butte. I wanted to hike up the butte, but it was getting late. 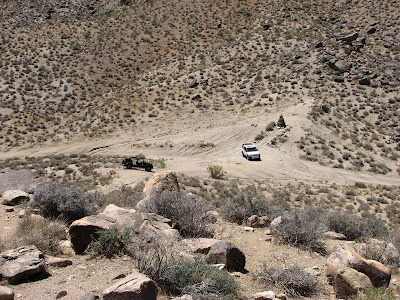 We drove out Warm Springs Canyon and then down Harry Wade Exit road ending up next to Ibex Dunes. It was a fun way to spend a day with lots to see and do. 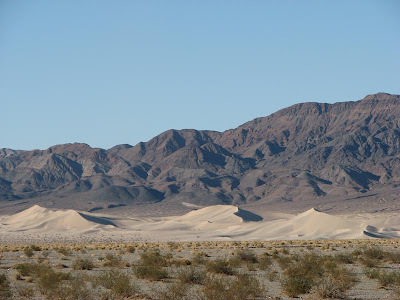 If you're unfamiliar with these places, here's a map centered on Striped Butte and here's one centered on Ibex Dunes. While we were preparing to take off toward Ballarat, a lone F-16 flew overhead at a couple hundred feet altitude. Cool. Goler Wash was pretty interesting. Several sections had a trickle of water running down the road. We came across one small big horn sheep, but it got away before I could get a photo. We stopped off at Barker Ranch. That was interesting, and I'll put the details in a separate post. 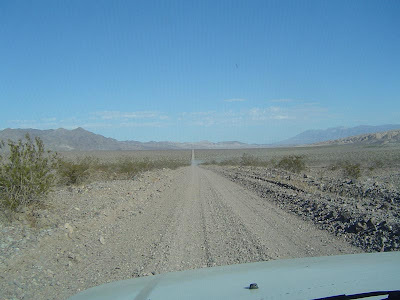 The section of road between Barker Ranch and the pass was pretty fun. Rugged enough to keep our attention, but not scary. Here are a few photos of that section. Here's a photo of our cars parked at Mengel Pass. The spur from there leads up the hill to a nice vantage point for photos. From that high point, I took this photo of Butte Valley. 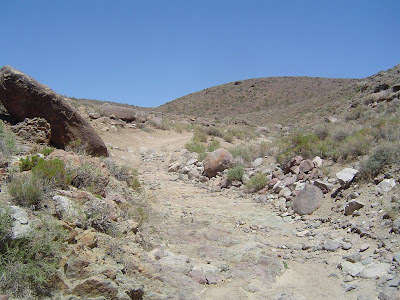 The only difficult section of road was the 30 yard stretch just NE of Mengel Pass. That's the only part that was more difficult than my drive up Lipppincott Road in May. We were both very happy to get down that without scraping bottom. Here's a photo of Mark inspecting that section to choose his route through it. My biggest challenge was the wide track of the LR3. Narrower trucks have more line choices. 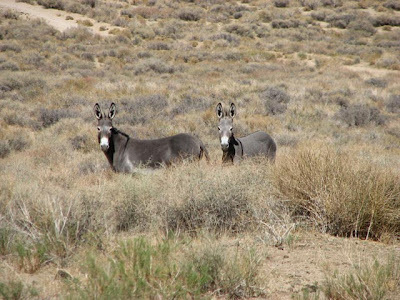 Two burros watched us carefully when we visited the Geologist Cabin. 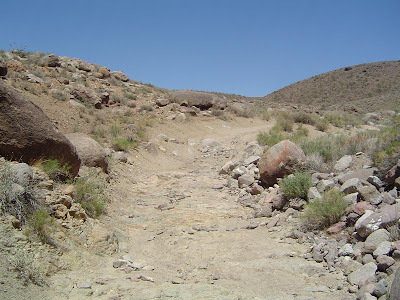 The 105F heat started to wear me down around Warm Springs Canyon and I finally turned on the AC. 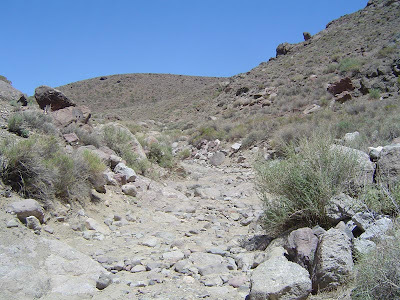 Mark claimed that it was pleasant in Warm Springs Canyon, but he said he really noticed it when we dropped down into the valley and the temps rose to 122F. This photo is looking west down Warm Springs Canyon Road from its intersection with West Side Road. Harry Wade Exit Road was in excellent condition and we think it was much faster than taking the highway. The 6pm shadows on the Ibex Dunes made for some nice photos. 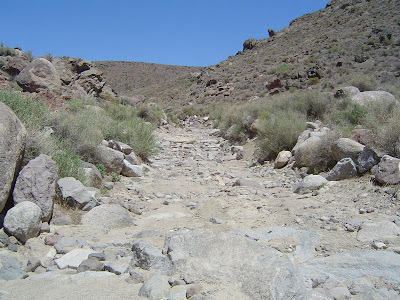 We didn't have time to drive out via Ibex Spring Road. Maybe another day. Did you take any pix in the lower part of Goler? I'm wondering how the Newman Cabin is. I'm sorry to say that I didn't take many pics of the lower section. We drove up over only 1 (of 4) notable dry falls - the others must have been buried in sand. We didn't stop to look at Newman's cabin. But we did stop to debate it. I was mostly admiring the geology and the occassional steel cable up to the mines. The road through the lower section was quite tame. Sorry. I've been distracted with life. Was a normal situation where 2 people didn't agree. He wanted to check it out, but didn't want to back track and drive up to the cabin. I wanted to continue on since time was slipping by, but we stopped and I walked 10 yards up and over some man-made basins on the east side and viewed a small structure on the side of a clearing. My next trek that way will definitely have more time alloted for all the sites along the route. I'm also tempted to try the pass going east to west. 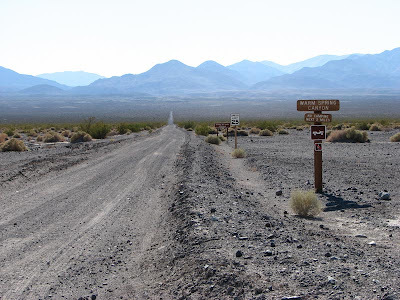 I may drive west to east and plan on camping at the cabins in butte valley, then i can attempt a return back west - knowing that I can always exit the long way eastward.